Following a successful launch event earlier this year, local health organisations in West Lancashire are hosting a follow up joint health and wellbeing event for cancer, respiratory and cardiac patients, and their families. 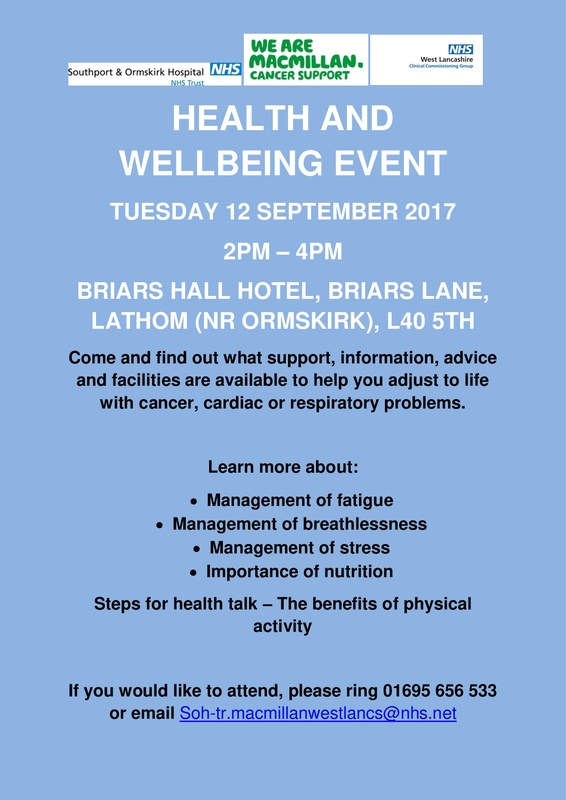 Taking place on Tuesday 12 September 2017 from 2pm to 4pm at Briars Hall Hotel, Briars Lane, Lathom (Nr Ormskirk), L40 5TH, everyone is invited to the free public event being run by Southport and Ormskirk Hospital NHS Trust, West Lancashire and Southport & Formby Macmillan Cancer Information & Support Services and NHS West Lancashire Clinical Commissioning Group. Focus on the day includes management of fatigue, physical activity and stress management for people affected by cancer, respiratory and cardiac issues. Local members of the public interested in health and wellbeing are also welcome. Caroline Flynn, Macmillan Information and Support Services Manager (West Lancashire), said: “This event is open to anyone looking for advice but is specifically geared towards those individuals who have undergone or are completing a course of treatment for cancer and/or who have respiratory or cardiac conditions. “Our specialists, including cancer nurses from the Trust, available on the day will be able to discuss what information, advice and facilities are available to help people adjust to a life with and beyond these conditions. The event will allow individuals to achieve a greater sense of control, feel more confident about their condition and feel equipped to access the information and support they need. Local voluntary, community and faith groups will also be attending the event, with several stalls people can visit for advice and information.